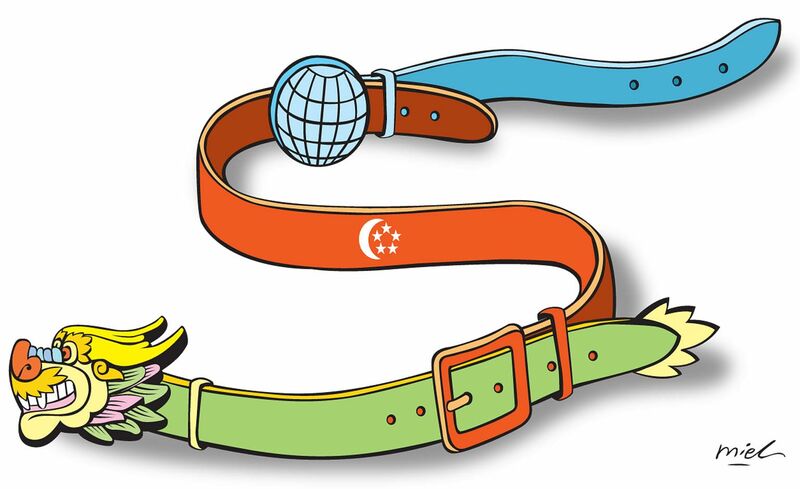 The Belt and Road Forum held last week in Beijing has generated wide interest among the business community in Singapore. China's pledge of more than US$100 billion (S$138 billion) in Belt and Road projects has resonated positively with world businesses, despite differing views with regard to the Belt and Road Initiative's (BRI) outlook. Singapore has always been a connector - most significantly for trade. Our role in the Maritime Silk Road (MSR) can be traced to the ancient MSR. Singapore's strategic location along this trade route led to significant maritime exchange, as evidenced by extensive archaeological records. Our prosperity depends on continuing to serve as a connector. We are a small country and, therefore, throwing our weight on either side of the geopolitical scale does little to tilt the balance. However, as a conduit between larger nations, we make ourselves a vital part of the conversation. We must engage everyone and obstruct no one. Better engagement at a diplomatic level facilitates better trade relationships, and better trade relationships lead to more effectiveness in diplomatic engagements. The BRI - a huge infrastructure project intended to revive ancient land and sea trade routes from Asia to Europe and Africa - is a chance for Singapore to put itself at the heart of a new global trade ecosystem and cement the future of Singaporean business. Singapore's strategic location at the crossroads of East and West enables it to be a key access point along the MSR, as it expands its role as a global transportation hub. About 2,700 shipping services depart from Singapore weekly, cementing its status as a key global maritime centre and the world's busiest port. Also, Changi Airport handles about 6,800 flights weekly, making it one of the largest air transportation hubs in South-east Asia. Hence, it is natural that Singapore continues to strengthen its potential as an important logistics and transportation hub along the MSR. In addition, Singapore's track record in financing, insurance, legal, arbitration, project management, and training and development positions it as a centre for providing numerous business opportunities in the BRI. The opportunities arising out of the Belt and Road Initiative are tremendous. Business can and must take the lead. Being a connector requires us to be neutral, and look towards the wider interests of the international community. We should approach and engage, or else risk being left behind. The stakes are simply too high. As a key regional financial centre, Singapore houses over 200 banks, with many basing their operational headquarters here for regional group activities. Also, as one of the largest offshore yuan centres, Singapore serves corporates and investors' yuan needs with enhanced convenience. Currently, several Chinese banks have issued BRI bonds in Singapore to finance projects. This builds on the strong record of project financing in Singapore with its ecosystem of insurance, legal and arbitration expertise. About 60 per cent of Asean infrastructure projects are mainly financed by Singapore-based banks. Against this backdrop, Singapore businesses can leverage their expertise by seeking opportunities to fund BRI projects. Also, Chinese companies can partner Singapore companies to finance projects in third countries. In recent years, Singapore has emerged as the top destination for Asian businesses expanding abroad. According to statistics published by the Ministry of Trade and Industry, more than 6,500 Chinese companies have established their presence in Singapore, almost twice the number of companies five years ago. This reflects the Chinese companies' interest to go global through Singapore or via partnerships with Singapore companies. On the other hand, China remains the top expansion destination for Singapore companies. Over the years, more Singapore enterprises and projects have embraced BRI-related policies and platforms to access the Chinese market. One key area is the development of government-to-government (G2G) projects. Last month, IE Singapore signed an MOU with the Guangxi government to jointly improve connectivity between western China and South-east Asia via Guangxi, reaffirming the close and mutually beneficial relationship between Singapore and China. We, therefore, urge Singapore businesses in these industries to step forward and offer their expertise, as their exchange of knowledge and information would be crucial to the projects' success. As Singapore continues to develop its capability in managing public- and private-sector projects, it can leverage its expertise in education, public policy, public administration and governance to facilitate the sharing of best practices in managing BRI projects. This can enable our foreign business counterparts from varying backgrounds to hone core skills required for implementing BRI projects. Singapore's vast experiences make it an attractive proposition for China to consider setting up a BRI Planning & Implementation Office here for closer G2G collaboration on BRI projects in the region. This is in line with Singapore's role as the country coordinator for Asean-China relations to act as a bridge between both parties. The BRI can contribute significantly to the Asean Connectivity Blueprint and help bridge the infrastructure gaps in the region. Singapore is well-placed to accelerate the realisation of these projects through informed assessments. The possible services that the office can provide include devising businesses strategies and responses, building corporate and financing capabilities, sourcing project development opportunities for infrastructure and urban planning through partnerships, and establishing overseas representative offices. In addition, Singapore's reputation as a country that promotes and upholds good relations with its neighbours will provide a neutral location for the office. Through enhanced cooperation and integration, participating businesses from China and Asean can stand to gain from improved development. A prosperous Asean will become a more important market for Chinese products and services. The Singapore Business Federation (SBF) was the first to respond positively and strongly support the BRI by mobilising, sharing, exchanging BRI-related information and increasing the business community's awareness of China's initiative. This has been done primarily through establishing platforms such as the annual Singapore Regional Business Forum (SRBF) and Belt and Road Digital Portal, and participating in BRI forums and seminars since 2014. During the 11th China-Asean Expo (Caexpo) in September 2014, the federation chairman highlighted the importance and significance of the MSR in his speech. The SRBF was inaugurated in 2015 to serve as a high-profile, neutral and constructive platform for regional business leaders, academia and government officials to network and discuss current issues in today's global economy - with the 21st Century Maritime Silk Road chosen as the theme. It has received strong support from the regional business community, with the number of participants increasing from 400 to 500 for the second SRBF held last year. The third forum is scheduled to be held on Aug 15 with the theme, Seizing Business Opportunities Through Regional Cooperation, incorporating a line-up of programmes that includes an MOU-signing ceremony, business matching, side meetings and networking among business leaders, launch of a Belt and Road English portal to reach out to a wider audience, and an inaugural regional business survey report under the BRI. Jointly launched by SBF and Singapore Press Holdings' Lianhe Zaobao, the Belt and Road Digital Portal aims to help businesses better understand the initiative and seize opportunities arising from China's trade and economic development plan. According to a survey conducted by the SBF, the portal has been well-received by the business community in Singapore, Asean and the greater China region, with readership hitting 7.8 million within one year of its official launch. The opportunities arising out of the BRI are tremendous. Business can and must take the lead. Being a connector requires us to be neutral, and look towards the wider interests of the international community. We should approach and engage, or else risk being left behind. The stakes are simply too high. China has charted the new trajectory for trade and investments with a grand vision and ambitious long-term plans; it is timely and opportune for us to work together to achieve more. As the old Chinese saying goes, "A nine-storey tower rises from a heap of earth; a journey of one thousand miles begins with the first step." Working together, we can progress collectively in an environment of stability, trust, confidence and prosperity. The writer is chairman of the Singapore Business Federation.